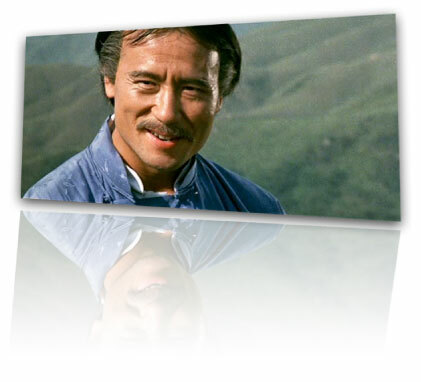 Master Hwang In Shik has starred in countless movies. Sometimes under his correct name, sometimes under the misspelled name of Wong In Shik or Whang In Shik. This page is a work in progress and we will try to add as many of his movies as possible with clips and reviews. Below you will find our work to date. For those that care, the image on the right is Master Hwang playing Master Kim in The Young Master (1980). This 1980 Hong Kong hit pits Master Hwang against Jackie Chan. Master Hwang plays a notorious criminal that must be brought to justice. The ending fight scene showcases Master Hwang's abilities and even though it's obviously enhanced for the movies, his students will undoubtedly recognize some of the moves they learn in class. Sorry to burst the Kung Fu bubble but that is actually Hapkido and not Kung Fu. Check out the Young Master page for more details and clips from the movie. In this movie, master Hwang plays the captain of the imperial guard who have conspired to steal treasures from the forbidden city. Visit the Dragon Lord page for more information.